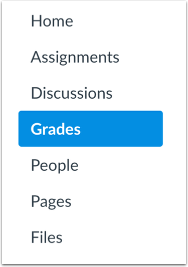 The Status option allows you to change the default colors in the Gradebook. 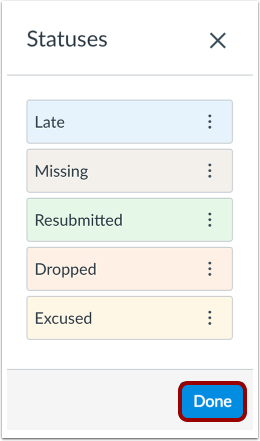 Each color is a default associated with a Gradebook status: late (blue), missing (red), resubmitted (green), dropped (orange), or excused (yellow). Colors can be adjusted by selecting a default color or using a supported hex code. Colors are a per-user, per-course setting, so the colors you set in your course do not apply to any other user who may view the Gradebook, and they do not apply to the New Gradebook in any other course. Additionally, status names cannot be changed. 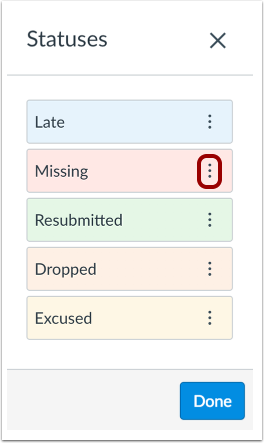 Note: Some colors may seem darker if they display in a Gradebook row that has an alternating gray background. In the View menu , click the Statuses link . View the color defined for each status. To change a color value, click the More Options link. Select the new color for the status. 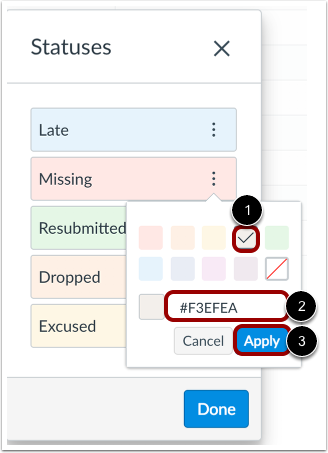 The check mark indicates the selected color , and the hex color code displays in the text field . If you want to use a color not shown in the window, you can enter the color's hex code directly in in the text field. The hex field will display a warning icon if the hex code is not valid. Click the Apply button . 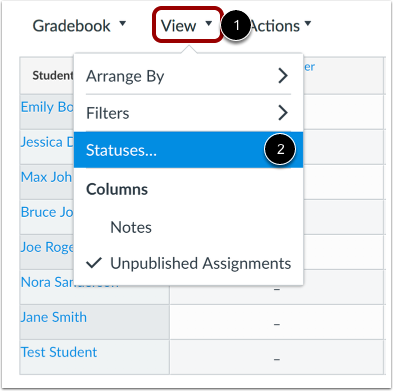 Previous Topic:How do I sort an individual assignment column in the New Gradebook? Next Topic:How do I mute or unmute an assignment in the New Gradebook? Table of Contents > New Gradebook > How do I change the color for a grading status in the New Gradebook?